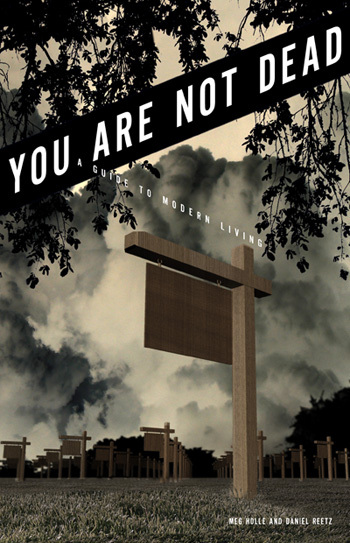 To complement the You Are Not Dead seminar experience going down in Vancouver May 27 – June 5, Daniel Reetz and I have published You Are Not Dead: A Guide to Modern Living (the Canadian Edition). While a small quantity will be available for sale at the play, this is print on demand, baby, so everyone can get in on the action. Read more about (and BUY! BUY! BUY!) the book at our publishing press, The Author Is Dead. Those who I occasionally see in person may also contact me or leave a comment below to buy a copy from me in the meatspace (this latter option may take a few weeks due to Things and Stuff, but comes with such advantages as Increased Revenue for the Fakeproject Corporation, the human touch and my precious precious autograph). Regarding the “publishing press,” maximum control of your work requires registering your own ISBN, and when you have your own ISBN, you basically have your own publishing company (minus a million things, of course, but in name, sure sure). In addition, for whatever backward reason, 1 ISBN costs $125 while 10 cost $250. While I am less aspiring publisher/author than thrifty shopper, I nonetheless have 9 more ISBNs burning a hole in my wherever-it-is-you-store-ISBNs. Yay? I think so. Yay! Next Article Next Article: d6 redux! where is the peanut gallery? have you been blogging so long that all of your readers have died and/or started their own blogs? Deepsicks could not survive eight years strong were I doing it for adulation. – What impact did you have? Can you grow the eyes that recognize the benefits and change you did bring? And if so, can this be done without overdoing the self-praises? Can self-worth be acknowledged in a realistic manner? – What do you do with self-hate feelings? Is simply dropping realistic or beneficial, since it implies dropping the will to understand a side of human nature? – What are the ways you showed yourself you do care? Others? Any common ground between the two (=balance)? Just sharing thoughts, hope that’s ok. Kudos. Of course you’re welcome to share thoughts, Anca. I’m glad you’re enjoying it! and glad you’re comfortable taking it (or some of it, at least) seriously. The somberness is not all pretend–it can be pretty dark, and definitely satirical–but that can make it too easy for people to write it off as all ironic or a joke, when really, it presents difficult questions that if we actually asked and answered to ourselves… well, it would probably be depressing (and some of it is downright brutal)–but it also just as well provides motivation for self realization and change.